But many s﻿cientists dismiss the need for the additional research — on the grounds that vaccines are already rigorously tested — and are flummoxed by the ONB’s decision to donate to Corvelva. “My first reaction was bewilderment,” says geneticist Gerolamo Lanfranchi of the University of Padova. Membership in the ONB confers certification for positions in the biological sciences in Italy — such as roles in nutrition, public health or environmental services. The ONB collaborates with university biology departments, including the University of Padova, to organize qualifying examinations for membership. The order has about 50,000 members who each pay an annual membership fee of €120. “There’s solid evidence that vaccines work and are safe,” says virologist Giorgio Palù at the University of Padova, who is president of the European and Italian societies for virology. The large-scale, expensive studies that test vaccines’ efficacy and monitor for adverse side effects are regulated and supervised by national and international health agencies and are “far more accurate than tests that could be done with €10,000”, says Gennaro Ciliberto, a molecular biologist at the University of Catanzaro Magna Graecia and president of the Italian Federation for the Life Sciences, which includes 14 scientific societies. Once vaccines are approved, these agencies continue to monitor them by testing batches and production facilities for safety, as well as tracking adverse reactions, he adds. But Marchi says that studies that monitor adverse reactions don’t track participants for long enough after they have been vaccinated, and so “cannot exclude the possibility that vaccines are toxic”. D’Anna emphasized that the donation to Corvelva is not the full amount that will be spent on the research. “Ours was a contribution among many,” he said. Corvelva has collected more than €50,000 so far, says Marchi. The organization will use the money to check whether the components of widely used vaccines are the same as those indicated on the label, and to look for contaminants. The tests will be done by still-undisclosed private analytical services, he says. A team of researchers funded by Corvelva posted the methodology behind the organization’﻿s earlier studies on vaccine components to F1000Research, an online platform where articles are first published and then peer reviewed by invited referees. The one reviewer who looked at the paper did not approve it. Marchi says that this reviewer has requested further data that the researchers will provide, but adds it will take several years for the analyses of the vaccine components themselves to be completed, because Corvelva plans to analyse batches of every vaccine available. Before then, Marchi says that the group hopes to influence the national debate on whether to continue with the 2017 mandatory-vaccination policy. In September, Italy’s newly elected government, a coalition between the populist Five Star Movement and right-wing Lega parties, extended until March 2019 a measure that allows parents to self-certify that their children have been vaccinated — instead of providing a doctor’s note — during enrollment in nurseries, preschools and schools. The Italian Senate’s health committee is currently debating two bills that would change the 2017 mandatory-vaccine law. One, introduced by Lega senator Paolo Arrigoni, would scrap the requirement to provide proof of vaccination. The other, introduced by Five Star Movement senator Stefano Patuanelli, calls for obligatory vaccinations only in areas where vaccination rates are low, or in cases of epidemics. If approved by the Senate’s health committee, the bills would then have to be voted on by the Senate and the House before they become law. “We need to bring our results to politicians, now that they’re drafting legislation on obligatory vaccinations,” Marchi says. Giovanni Maga, a molecular biologist at the National Research Council’s Institute of Molecular Genetics in Pavia, worries that, at a time of heated political debate on obligatory vaccinations, the ONB’s decision to fund this research could affect public opinion by increasing distrust of vaccines. But D’Anna rejected this idea. On the contrary, he said, more people will choose to vaccinate their kids if “we could guarantee them the absolute safety of vaccines”. 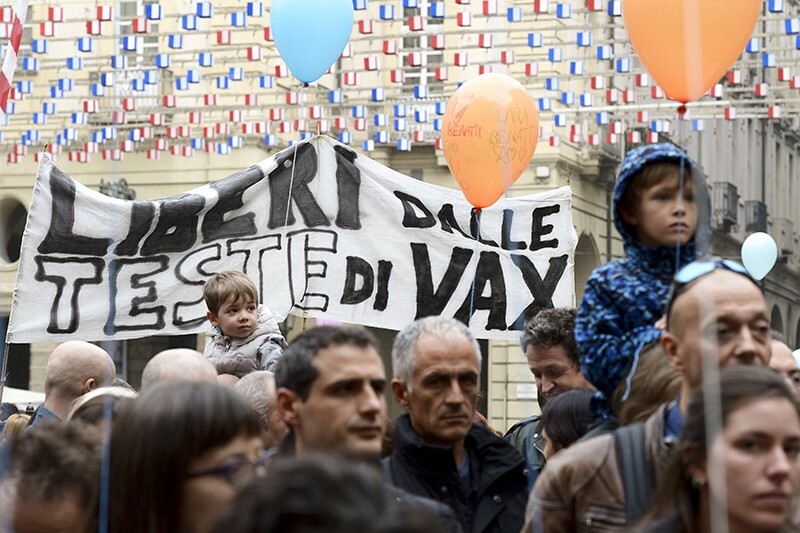 D’Anna said that neither he nor the ONB can be in any way defined as ‘no-vax’, a term that in Italy refers to people who are against vaccinations, and says that he has never questioned the efficacy of vaccines. “The ONB and the biologists know well the merits of vaccines, and want to know all the rest about their safety,” he said. The debate about the donation follows criticism of a conference to celebrate the ONB’s 50th anniversary in March. Some academics and scientific societies — including the Italian Society of Hygiene, Preventive Medicine and Public Health — urged the ONB to revise the agenda because they were concerned that anti-vaccine ideas could be promoted, although the ONB rejects this criticism. Both the donation and the choice of speakers at the March meeting are included in a petition calling for the Ministry of Health, which oversees the governance of the ONB, to remove D’Anna as ONB president. The petition, created by three graduate biology students who formed a group called Biologists for Science in the wake of the controversy over the March meeting, says that these and other actions by the ONB endanger public health and discredit the scientific community. In a telephone interview with Nature, D’Anna said he won’t step down. And in the e-mail interview, he dismissed the seriousness of the petition because it was launched by students. He said that those who want to verify whether “hundreds of biological and chemical impurities” can harm children do not endanger public health. Lorenzo Elli, a molecular biologist at the Circolo Hospital in Varese who is registered with the ONB, says he signed the petition to show his disapproval for the donation to Corvelva. He says that he considered not renewing his membership, but decided against it because he must be registered with the order to work in public health care. A spokesperson for the Italian Ministry of Health says that it has received “a report on the matter” of the ONB donation to Corvelva, and that the ministry asked the ONB “to provide information on the subject”. “As soon as the required information has been acquired, the assessments of competence will be carried out,” says the spokesperson. The ministry doesn’t fund the ONB, but it is tasked with ensuring that the governing board abides by its duties.